MLS stands for Multi-Wave Locked System – the key phrase being “multi-wave.” That’s because, unlike other lasers, it uses multiple light wavelengths to produce simultaneous effects. In one fell swoop, it penetrates, blocks pain, and boosts new cell growth! No other laser can do all that, all at the same time. How Does MLS Laser Therapy Help With Foot Pain Relief? 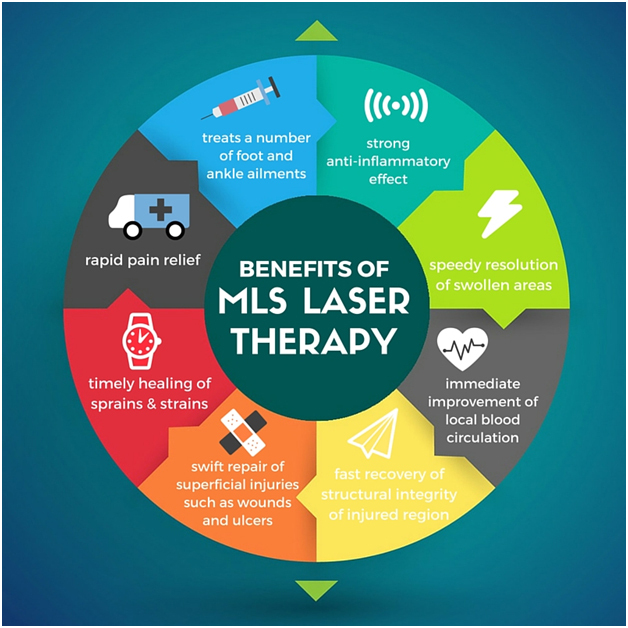 How Does MLS Laser Therapy Accelerate Healing? At the same time that pain is being blocked, cell repair and growth are given a boost. The laser light increases cell energy so it can take on nutrients faster. Circulation is stimulated, increased blood flow delivers nutrients at a faster rate, speeding up the healing process, helping you to recover more quickly. This non-invasive treatment can help relieve many sources of pain, including arthritis, heel pain, neuromas, wounds, sports injuries/sprains, tendonitis, nerve issues, and more! It has a host of other benefits as well! There are no known side effects; it’s safe and pain-free, with patients reporting just a mild, warm sensation. Sessions take place in our office, and typically last less than 10 minutes. The number of sessions you’ll need depends upon your condition and severity of your symptoms or injury. In most cases, however, noticeable results are achieved within 2-3 visits. Keep in mind that the effects of MLS are cumulative so it’s important to complete the treatment plan provided so as not to allow symptoms to reoccur. Multiple clinical studies have been conducted that prove that low level laser therapy is superior in speeding pain relief. Whether you are suffering from ongoing foot pain or are recovering from foot surgery, the fastest healing results are obtained with MLS laser. Our own experience supports this conclusion, both when treating discomfort from various foot conditions or when treating patients with MLS pre- and post-surgery. Please contact us for more information about this new, effective therapy. Get on the Fast Track to Relief & Recovery! If you have suffered a foot injury or continue to struggle with chronic foot pain, contact us today to find out more about MLS laser therapy and how it can help you. Just dial 816.525.4778 or use our convenient online contact form, and let us help you get back to pain-free days and the lifestyle you love. The road to recovery just got shorter! You will need an initial evaluation for your foot pain, and then laser treatments will be scheduled.